The second week in February offers tasting previews of Tuscan wine that are about to be released on the market. The following are only several of the events open to professionals and the general public alike. 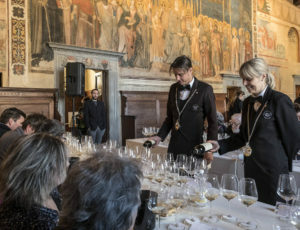 Estates from seven of the eight Chianti DOCG sub-zones will showcase their 2017 vintage and 2015 Riserva at Chianti Lovers in Florence on February 11. Besides its towers and artistic treasures, another reason to visit San Gimignano on February 11 is the Anteprima Vernaccia held in the Museo di Arte Moderna e Contemporanea De Grada (via Folgore 11) from 2 to 7 pm with free admission. The 2017 vintage and the 2016 Riserva will be poured at the event. Tuscany’s most interesting white, Vernaccia is of ancient origin and the most historically documented wine of Italy. Vernaccia is produced around the lovely medieval town, miraculously preserved like an antique jewel in a box set on a hilltop, surrounded by velvet rolling hills. What makes Vernaccia of San Gimignano so special, so unique? It is the terroir. In order to avoid an exhaustive technical explanation, let’s just say it is a combination of the growing conditions that are particular to the area, including climate, rainfall, sunshine, but most of all, the soil. The quality of the limestone clay and tufa soil highly influences the flavor of this white wine.For those in the know, Vernaccia wine has always been synonymous with quality. From Dante and Boccaccio’s honorable mentions to 1966 when it was the first Italian wine to receive the DOC (Denominazione di Origine Controllata) title, upgraded to DOCG in 1993. Vino Nobile di Montepulciano DOCG is regarded by many as one of the elite Italian wines, by some—the best. Capped as Nobile (Noble) by the Governor of the Conservatory of San Girolamo in 1787, the Vino Nobile di Montepulciano was among the first group of wines in Italy to receive DOCG appellation in 1980. Each year at the Vino Nobile preview, the previous vintage of wine is awarded stars on a 5-star scale, with 5 considered excellent. This year experts will be allotting stars to 2017 based on the climactic and micro-climactic factors between April and September. Open to the public on Saturday and Sunday, February 10 and 11, the Nobile 2015 (a 5-star year), the 2014 Riserva as well as other Montepulciano wines will be previewed at the Medici fortress. From 3 to 7:30 pm on Saturday and 11 am to 6:30 pm on Sunday, the wine enthusiast may peruse the offerings from over 40 wineries amounting to over 100 wines. For centuries, the echo of the famed Vino Nobile di Montepulciano has sounded well beyond the borders of the lovely town from which it comes. The wine’s fine qualities have been recognized throughout the world even though it has always been sparingly produced on the slopes just east of Montepulciano. The landscape’s soft tufa volcanic rock helps to create the resonance of a wine that is an integral part of Italian culture. Prugnolo Gentile, a clone of that mainstay of Tuscan reds, Sangiovese, is the grape used in producing Vino Nobile. During the preview, be sure to devote some time to visit the area, as the party is sure to spill over into the quaint medieval alleys of Montepulciano as well. 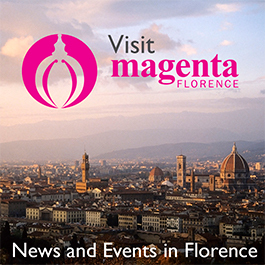 At the center of a historic tug-of-war between the republics of Siena and Florence, the town has a distinctly Florentine look.